Average Height	: 19" - 20"
Average Weight	: 43 - 48 lbs. Norwegian Elkhound Rescue & Referral of New England, Inc. The Norwegian Elkhound originated in Scandinavia and is one of the most ancient breeds; it is thousands of years old and has been around since the Stone Age. A skeleton similar to today's Norwegian Elkhound dating from 4000 to 5000 BC has been found. To put some perspective on it, these dogs have been around since man hunted with slingshots and lived in caves. They worked as a hunting and guard dog for the Vikings. The dogs were used as big and small game hunters tracking animals such as moose, elk, bear, mountain lion, badger, lynx, wolf, reindeer and rabbit. The dogs would track the quarry and alert the hunter by barking, holding the animal at bay until the hunter arrived. Norwegian Elkhounds can smell game from over a mile away. The dogs tended to work better at night than in the daytime. The breed is also highly prized as a sled dog. In case of war, the Norwegian Defense Minister has the power to mobilize all privately owned Elkhounds. In more recent times, the friendly and reliable character of the Elkhound has helped win a place in many homes as a cherished family pet. The name "Elkhound" is a direct translation from its original Norwegian name "Elghund," meaning "moose dog." In Norwegian, "elg" means "moose" and "hund" means "dog." The breed was first exhibited in 1877 when the Norwegian Hunters Association began holding shows. The AKC first recognized the breed in 1913. In 1923, the Elkhound Club was formed and the breed was officially recognized by the British Kennel Club. Some of the Elkhound's talents include: hunting, tracking, herding, watchdog, guarding, sledding and agility. There is also a Black Norwegian Elkhound that is recognized as a separate breed, but is almost identical in type except for color. The Norwegian Elkhound is a combination of the traits found in both the spitz and hound breeds. As a northern type dog it has been bred for its ability to be outside and be on its own, and this independence is very noticeable in the breed, especially when they are young. They also have the fun-loving and playful personality of a hound and make excellent family dogs. The Norwegian Elkhound is a great pet with children and is a natural watchdog and guard dog, protecting its territory. Historically used as both a hunter and sled dog, its role was to keep game in one spot until the hunter arrived. Norwegian Elkhounds will bark for long periods of time to let the family know that something is new or unfamiliar in the area. Although they are very affectionate and loving towards the family and people they know, they are rather aloof and distrustful of strangers. The Norwegian Elkhound needs to be socialized at an early age to prevent it from becoming dog-aggressive. This aggression is most noticed in intact males so both socialization and neutering is strongly recommended before aggressive behavior starts. The best option for keeping a Norwegian Elkhound as a companion dog in multiple dog households is a opposite gender neutered or spayed dog as a companion. 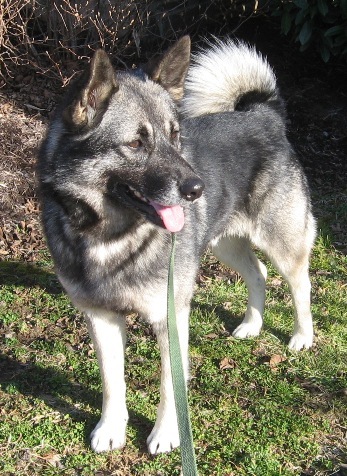 The Norwegian Elkhound loves to be with people and does require daily attention, exercise and time with the family. They will love to play and run and do best in families that are on the go and busy, but can also adjust to quieter situations with lots of opportunities for exercise and to be outside. A northern breed, they love to be outside in cold weather but may have difficulty in adjusting to very warm climates. The breed is highly intelligent and has a hounds natural hunting ability so need to be in a fenced yard to prevent wandering and roaming. They can have a very high prey instinct and may not do well with cats and other pets unless they have been raised together since the Norwegian Elkhound was a puppy. The Norwegian Elkhound is not a dog that will follow every command from the owner as soon as it is given. They are independent and will often be distracted by other activities they find more interesting than what the owner has in mind. They are, however, very easy to train using positive, firm training methods and lots of petting and attention for a job well done. They love to work with people and do best if considered part of the family rather than left alone. The Health conditions most often seen in Norwegian Elkhound are the same as many of the larger breeds. These include canine hip dysplasia and Progressive Retinal Atrophy, an eye condition found in most breeds. In addition some Norwegian Elkhounds will develop pyotraumatic dermatitis, more commonly known as Hot Spots. The Norwegian Elkhound has the same grooming requirements of most of the northern breeds. The coarser outer hair is rather stiff and not prone to matting however the softer inner hair can be. Brushing twice a week with a firm bristle brush, pin brush or rubber brush followed by a metal comb is the best possible grooming routine. They are average shedders year round but have very heavy seasonal sheds when the downy undercoat is completely "blown". At these times the hair will come out in clumps, and the dead hair can mat into the outer coat if brushing is not regularly completed. Since the breed is prone to hot spots and skin irritations regular grooming will help owners monitor these conditions as well as removing the old, dead hair and minimizing the irritants against the skin. The breed has no odor and so bathing should only be done when absolutely necessary and only with special dog shampoos and conditioners. Over bathing will strip the weather-resistant oils from the hair resulting in dry, damaged hair. The area around the rump and the back where the tail rests can be particularly difficult areas to keep free from tangles and mats. When grooming pay special attention to these potentially problematic areas. The Norwegian Elkhound breed requires a fair amount of exercise per day. They are the dog version of a distance runner, preferring longer walks and jogs to short bursts of activities. Many breeders recommend at least a solid hour of fairly intense physical activity per day. If the family has children a romp in the yard with the kids after school will be a perfect activity for fun, attention and exercise for the dog. Since the Norwegian Elkhound was used as a hunting dog and has hound tendencies, it is always recommended that these dogs be on a leash or lead when outside of the yard. They will roam and wander and may become so engrossed in an interesting scent or in chasing a squirrel that they completely ignore the owners calls. The Norwegian Elkhound will play very will with other dogs that it is raised with and socialized, but should not be off leash when unfamiliar dogs are around as they can be very protective and somewhat aggressive. They do need a place to run and exercise, although they can adjust very well to a small indoor living space and will be well behaved and calm indoors after exercise. The Norwegian Elkhound is a relatively independent dog that needs early training and socialization to be friendly and well-behaved dogs. They do not respond well to negative types of training and are reported to actually remember any negative treatment or unfair or harsh punishment. They will bond very strongly with a family that treats them well and will work hard to protect and interact with the family. As an independent breed a Norwegian Elkhound is not recommended for owners that want a dog that will immediately respond to all commands. The Norwegian Elkhound typically will respond to commands but tends to respond after considering the situation rather than upon the immediate command. This is likely due to their breeding which encouraged dogs to think and problem solve when they were chasing or holding game until the hunters arrived. The Norwegian Elkhound requires high levels of socialization when they are young to prevent any possible dog aggression or wariness of strangers. They are a watch and guard dog breed and were bred to bark to alert people and need to be taught to only bark for short periods of time. When bored or alone for long periods they can become problem barkers very quickly. A Norwegian Elkhound will need to be exercised before training sessions to ensure that the dog can focus. A good hour of exercise is usually sufficient to allow them to attend to what you need. Obedience training is ideal as it helps owners establish their command in positive and controlled settings as well as providing excellent socialization opportunities for the young dog. A very intelligent dog they are quick to learn with the owner expects of them and will need little prompting to learn a new trick or command. They should not be taught through highly repetitive training as they will become bored and non-responsive. Since the breed can have a high prey instinct socializing with other animals, especially cats in the house, is critical at a young age. Norwegian Elkhounds that have not been socialized with other animals should never be left alone with the animals, even if things seem to be going well.